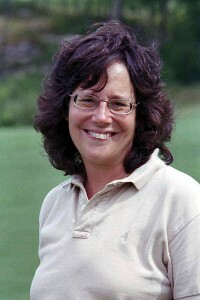 After a long career in the financial world, Marian Hausman Castner switched directions and now is the editor-in-chief and publisher of Golfers Tee Times, NJGolfNews and the Passport To NJ Golf. Luckily, she is able to work on these projects and also enjoy time with her young twins, Kathleen and Eric. She occasionally is a freelance writer for several golf magazines and newspapers, and several websites, including Golf In NYC. She is also working on some independent writing and business projects. Marian has worked for many years in the golf industy – teaching golf and working at both private and public golf courses in the NY area. She gained a strong background in golf event planning while working as the Outing Director at Van Cortlandt Golf Course in the Bronx. She has done part-time work for several years in the promotional products and travel businesses. She credits her high school English teacher, best-selling author Frank McCourt with her writing style and her husband, Bill, for sharing with her his passion and knowledge of the game of golf. Marian can work with your business or individuals in planning a corporate golf event, working on the details of a golf school outside of the NJ area, or work with clients to improve their game. Marian is a graduate of University of Pennsylvania.